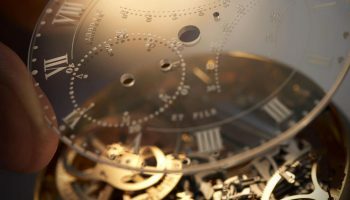 0024 WatchWorld looks back to the past, when innovative watches were being launched that proved to have great influence on the development of the watch industry. 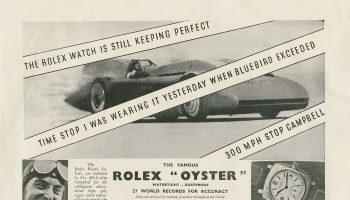 We follow the trail of these milestones by reminiscing with the use of old advertising campaigns. 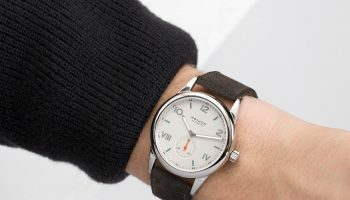 In this thirteenth and last episode we would like to take you back to the early years of the quartz watch – the Swiss battery-powered quartz watch, mind you – when Rado was presenting the luxury variants of the DiaStar pictured here. Scratch-resistant already, but not yet ceramic. Nothing feels quite as ‘Seventies’ as an old advertisement for luxury products in a German magazine. 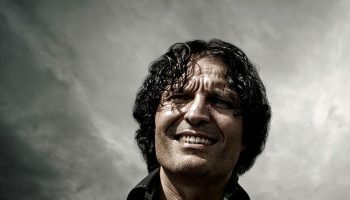 The feel of a ‘Krimi’, a TV crime show, set in the wealthier areas of a city like Munich. The young wife of an art dealer is found dead behind the wheel of her Maserati Merak, a gold Rado DiaStar on her lifeless wrist. Not a watch given to her by her husband, but by the tennis coach who also wears a gold DiaStar … So, the DiaStar. 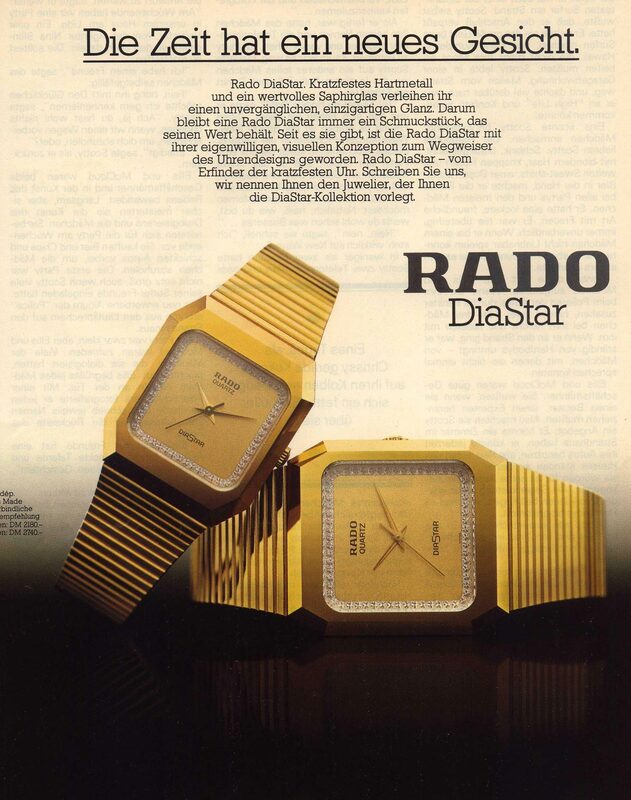 In 1962 Rado presented a watch with that name for the first time. 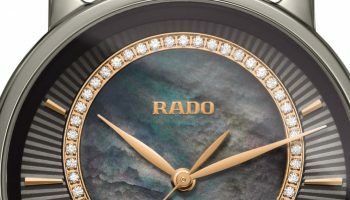 Or rather a collection with that name, because those searching for the Rado DiaStar will find a vibrant collection of watches in all shapes and colours. The original DiaStar is a robustly rounded watch with an almost shield-like appearance – one look at the black D-Star, a direct descendant of the DiaStar, elsewhere on the page clarifies the cumbersome description. The predominant characteristic of the DiaStar is its very high scratch resistance. In fact, it’s the first scratch-resistant watch in the world. Before the DiaStar was presented, gold and steel watches were being produced. However, Rado wanted to create a sports watch that would actually be able to stand up to abuse during sports. Normal steel didn’t make the cut and so the Swiss started experimenting. The ultimate choice was tungsten carbide, an alloy of tungsten and carbon fibre. The 1962 DiaStar was the very first watch made of that rock-hard alloy and was advertised as being “the world’s first scratchproof watch”. Over the years a range of very differing DiaStar models came out: with a gold colour, with extremely three-dimensional dials and exotic case shapes that were a perfect fit for the fashion of the 1960s and 70s. The material used was revolutionary and the designs were anything but conservative, although they were definitely sumptuous. The gold-coloured watches in the advertisement cost 2,180 and 2,740 German Marks respectively; a serious amount of money in those days. The quartz watches are praised for their durability. The hard metal used ensures that this jewellery will never lose it golden shine. Over the years the name DiaStar changed into the apparently more modern sounding and looking D-Star. The D-Star family consists of more than twenty very different references, each and every one of them referring to the DiaStar which, in its many manifestations, played an important role in the development of Rado as a watch house with a ‘scratch proof’ reputation. The black D-Star shown here is (obviously) made of black high-tech ceramic and houses an automatic ETA movement that can supply a 38-hour power reserve. 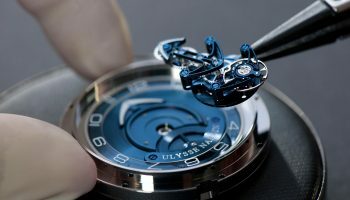 Gaat Grand Seiko de Zwitserse merken voorbij?